This past weekend I had the opportunity to go to Detroit for my cousin's bachelorette party! (I am standing up as one of the bridesmaids) We had a really great time and it was nice to visit with all the other girls involved. Here is the epic show in a nutshell for your viewing pleasure. I will say this was a wonderful show, and a little bittersweet for me. 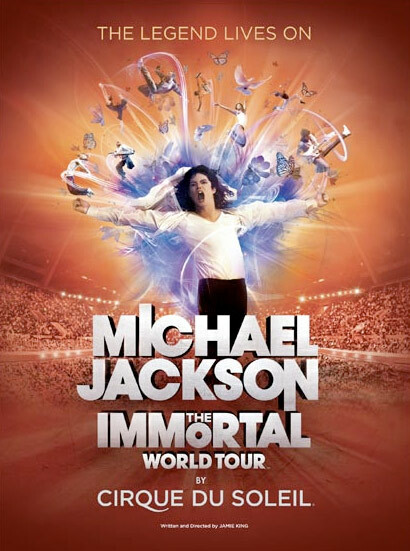 I wish it was Michael Jackson that I was actually witnessing, and some of the background cinematography was taken from his last "This is It" tour he was supposed to do. I was mesmerised by the imagery of him while the band played. The band was so damn tight and I could have watched them play alone all day. The dancers and amazing acrobats were perfect. The pole dancer, I quite fancied as she was also so very strong and graceful. The show in whole was lovely. There would be a couple things I would have changed, like too much of Bubbles the chimp and the giant dancing glove and shoes was sort of tacky in my opinion. But the lady that stole the show and my heart was Tina Guo on the electric cello. She was beautiful and her whole vibe was just fantastic on stage! I wanted to see more and more of her! This post is basically about her and how she reminds me a little of my other favourite string player, Vanessa Mae who plays beautiful violin! So, of course I had to find more of her work, and she has a single called "Queen Bee" and it has this Apocalyptica vibe to it. I am going to post it below. Michael would have been so proud! Cirque Du Soleil did a wicked show, and if can get a chance to have a night to relive the magic of Michael Jackson, you really should! Do you know the name of the pole dancer in this one? I'd love to see her do some more acrobatics in another Cirque if I knew she was in it. Thanks so much! I did some hard searching, but so glad you found this! Sorry for the super late reply. Did you end up finding the pole dancer's name?